I first had this salad 30 years ago when I arrived in the Dominican Republic. It was known as the Christmas salad and was served with Dominican Rice and Beans. 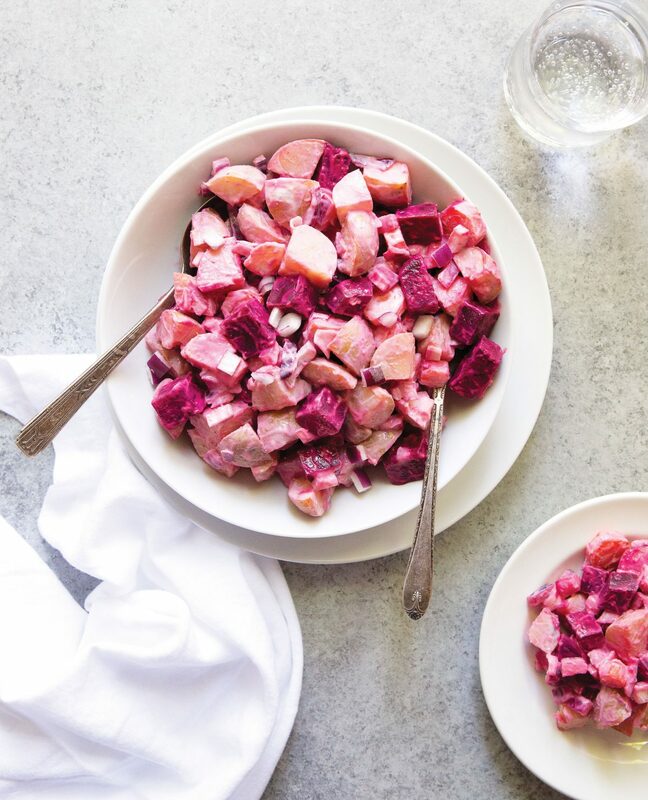 Since then we have made this colorful, bright pink salad often, and it’s our favorite salad to serve with Caribbean Moro. 1. Combine potatoes, beets, and carrot in a large saucepan and cover with water Bring to a boil over medium-high heat and cook until soft. Drain, then set aside to cool to room temperature. 2. Peel and dice the potatoes, beets, and carrot. 3. Add mayonnaise, onion, and vinegar. Mix until vegetables are covered. 4. Season with salt. If necessary, depending on your preference, add more vinegar and/or mayonnaise. 1. Blend all ingredients in a food processor until smooth. Taste and add more salt and/or lemon juice if needed.